IHG® Rewards Club - Film - Barney's Worldwide Adventure! 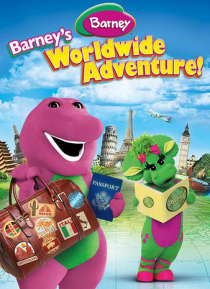 Barney and his friends have a stu-u-u-pendous time learning and traveling around the world. Barney puts on a show in Greece then takes Emma on a trip to Venice. Baby Bop brings her butterfly Monty to Mexico, while Barney introduces a dancing horse in Spain. Then the search is on for colorful eggs in Kenya, a music box in Switzerland, and birds of paradise in Hawaii. Sing along to your favorite son… gs on this worldwide adventure with Barney and his friends.